I would urge you to have this recipe bookmarked or take a print and store in your recipe diary. Replicate it in your kitchen when you are looking to cook something that is not only rich in nutrition but also high in delish factor. Bajra or Pearl Millet is as old as Indian civilization and has always been part of diet of our ancestors. With the changing times, as India progressed, a large chunk of Indians embraced urban way of living. This resulted into us making several inadvertent food choices without being really aware of their repercussions on our lives. Unfortunately, this meant that millets got replaced with Wheat and rice. During the course of past few decades we have been fed to flawed idea of grains like rice and wheat being more superior over millets which is more preferred by rural India. We have seen this divide widen over past few decades. Thankfully, things have begun to turn around now with more and more Indians becoming aware to health complexities and lifestyle diseases (read diabetes) that we have exposed ourselves to after making not-so-wise changes to our diet in the past. This has prodded us to explore and make some changes to our diet that could help us lead a healthy lifestyle. While I feel delighted that we are embracing a healthy lifestyle but the changes that we are making to our diet are still debatable. I have seen Oats and Quinoa feature more prominently not only on super-market shelves but also in our pantry. While I have no personal animosity towards these grains and include it in my diet myself, what bothers me is the total disregard that we knowingly or unknowingly exhibit towards our local products like Jowar, Pearl-Millets, Ragi and Amaranth(Rajgira) . Each of these grains are a nutrition powerhouse and at all costs must be part of our diet. 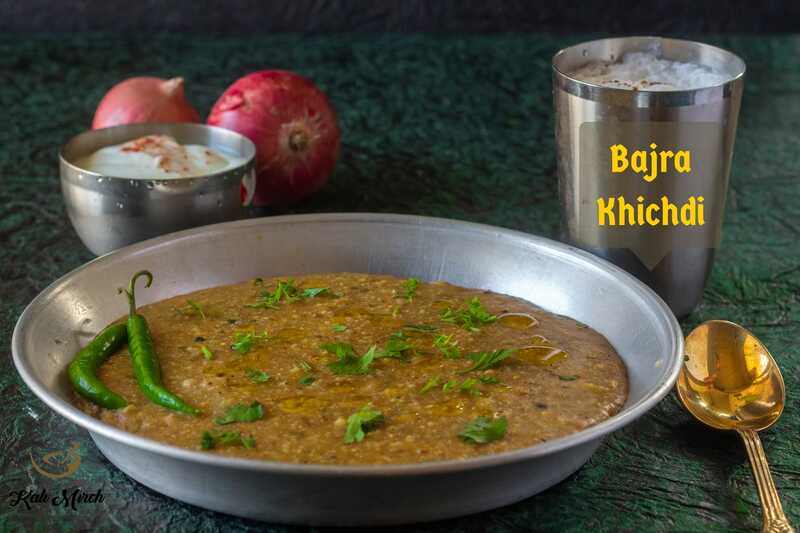 Pearl-Millet or Bajra is a staple in Gujarati and Rajasthani cuisine which is evident from the several delicious dishes made of Bajra in this cuisine. Being high in dietary fiber Bajra is one super-food that must be part of a diet for someone who is looking for diabetic friendly menu. Presence of fiber not only results into feeling of satiety but also slows down entry of glucose in bloodstream and prevents rise of glucose level in blood. It also aids in weight loss by keeping you full for a longer duration and thus preventing binge-eating. Bajra is also rich in magnesium, phosphorous and iron. Bajra Khichdi is one of the healthiest one-pot meals that not only ticks all the (right) boxes in a nutrition and health chart but also won’t disappoint you on the barometer of taste. I would urge you to have this recipe bookmarked or take a print and store in your recipe diary. Replicate it in your kitchen when you are looking to cook something that is not only rich in nutrition but also high in delish factor. Make this delicious Khichdi for your family and remember to share your feedback with us in comments section below. 1 Cup=200gms Bajra/Pearl Millet-Wash and Clean Bajra. Soak overnight. Drain excess water from soaked Bajra. We will grind soaked and drained Bajra in a grinder jar. Grind Coarsely. Wash and Clean Moong Dal separately. We will use a pressure cooker for making Khichdi. Heat 2-tbsp Ghee in cooker. Add Cumin Seeds. Now, we will add whole spices in Ghee. Add Cinnamon sticks, Peppercorns, Cloves, Asafoetida Powder. Fry for few mins. Add chopped Chilies and grated Ginger and fry for few mins. Add Turmeric Powder, soaked Moong Dal. Add coarsely grounded Bajra. Cook for 2-3 mins. Now we will add water. We will follow 1:5 ratio. For 1 Cup Bajra, add 5 Cups Water. Bajra absorbs water while it gets cooked, so we have added 5 Cups water. Add Salt to taste and mix well. When Khichdi starts to boil on high heat, add chopped Coriander Leaves. Cover Pressure cooker and cook on medium-heat. We will take 1 whistle on medium-heat. Lower the heat and cook on low heat for 10 mins. We have cooked Khichdi for 10 mins (2 whistles) on low heat. Switch off the heat and allow pressure to release naturally. When pressure is released naturally, we will make a Tadka. Heat 1-2 tbsp Ghee. Add Red Chili Powder. Pour this Tadka on Khichdi. Healthy and delicious Bajra Khichdi is ready to be served. You can add generous serving of some more Ghee on top of Khichdi.